I am so excited to share Caitlin & Kyle’s wedding at Paradise Springs in the Sierra National Forest today!! I’ve known these two for several years now and photographed Caitlin’s sister Ashley’s wedding in 2013. I was so excited to hear about Caitlin and Kyle getting engaged and even more excited when I received an email from Caitlin asking me photograph their wedding. The moment she started telling me about their wedding plans I knew it was going to be one amazing day! Their wedding day started off with the two of them getting ready in cabins on the venue property. They were both chill and enjoying the time with their friends and family. Kyle and I headed down the road a ways to a grove of Giant Sequoias where he had picked out a spot for their first look. They had their first look in the forest amongst giant sequoias with ladybugs fluttering everywhere. There were hundreds of lady bugs! Yes, hundreds of them and it was absolutely magical. Lady bugs have been a sort of a good luck charm for Caitlin & Kyle since the beginning of their relationship. Caitie-bug is the nickname Kyle gave Caitlin and lady bugs always seem to show up in random places at just the right time as a comforting little reminder for them. It was the coolest thing ever that the place where they had their first look had lady bugs everywhere. Caitlin walked down the forrest trail and as she got closer to Kyle their dog Memphis was so excited to see her that he ran right over. Kyle turned around and saw his bride for the first time on their wedding day all speckled with lady bugs on her dress and in her hair. I think this may have been my favorite part of their day! The ceremony was set up with the forest as the backdrop! The tall trees towering around us were so beautiful. This area around Yosemite is so so gorgeous! It was the perfect setting for the two of them to commit their lives to each other. They both love camping, hiking, fishing and exploring the outdoors together so it was only fitting to have a wedding centered around what they love to do together. If you haven’t seen their epic engagement session in Mammoth you have to check it out! See it here. So much fun adventuring in the mountains, checking out the hot springs and even some fly fishing (well sort of)! I am excited to share Nicole and Jesse’s rustic wedding at TAP Ranch near Santa Clarita on the blog today! These two are the nicest people and so easy going. 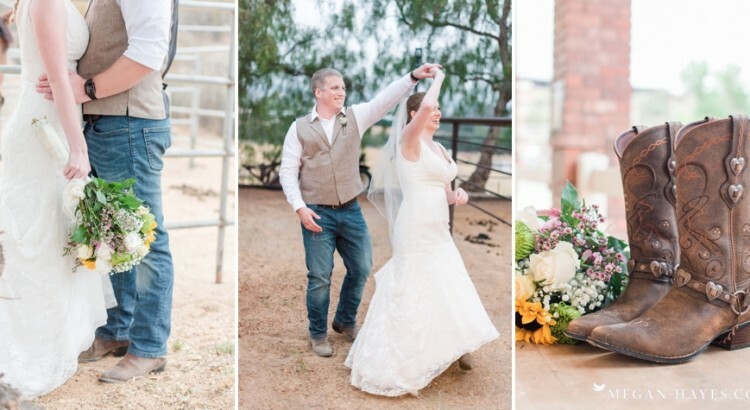 They started off their wedding day getting ready at the Sweetwater Movieland Ranch. This is also where they had their First Look and took some portraits together and with their bridal party. It was an overcast day which was perfect for having some nice even light in their photos! After they we finished at Sweetwater we headed over to TAP Ranch for the wedding ceremony and reception. The best part about TAP Ranch is that it’s a horse ranch and who doesn’t love horses? The guests were seated on hay bales and the ceremony took place at the top of a small hill by one of the barns. It did start raining a little towards the end of the ceremony and got pretty chilly but everyone still kept smiling! The reception took place under the stars with pretty patio lights. Their first dance was so beautiful to watch. As the music played in the background they both were beaming and even tearing up over how happy they were to be married. I think my favorite part from Nicole and Jesse’s day was the look on Jesse’s face when he saw Nicole for the first time. Jesse covered his mouth with his hand as tears began to well up in his eyes. It was perfect! See their engagement session here. Adriana and Aaron’s wedding day at the Castaway Restaurant in Burbank was full of laughter, smiles and pretty details. These two have been nothing but amazing to work with. It’s so fun to meet with a them, talk about their wedding day and then months later see it all come together so beautifully. I’m so excited for them and their new beginning as Mr. and Mrs. Zell. Everyone was so very excited for these two and to see their dreams come true as they tied the knot! They both had the biggest smiles and there were many times throughout the day where their happiness was so much so that their eyes welled up with tears. It started when they exchanged gifts with one another before seeing each other at the ceremony, then during the first look with her dad and brother, continued just before and during the ceremony and then more happy tears during the speeches at the reception. It was so evident just how much these two love one another and their families. The mountains in the background of the ceremony site were so pretty and so were all the trees surrounding them. Adriana looked stunning in her gorgeous dress and to top it off she had the most amazing bouquet of white peonies. I am a sucker for peonies, they are probably my favorite flower or at least the runner up to tulips. As the day went on and the reception began they continued with their big smiles and had the best time with their friends and family at the reception. Congrats Adriana & Aaron!! I wish nothing but the very best for you two in your future as Mr. and Mrs. Thank you for allowing my team to document your day and being so amazing to work with! I’m so very excited to share Taylor and Alex’s wedding at their family’s cherry ranch in Leona Valley. Leona Valley is just a short drive from Santa Clarita and I always love the view on the way there. There are several farms, ranches, orchards and vineyards along the way. Their family and close friends are very important to them which is why they quickly decided that they wanted to have a cozy intimate outdoor wedding and ceremony. Alex suggested his family’s cherry ranch and Taylor jumped at the opportunity. You will definitely see in the photos that it turned out to be the most perfect place for their wedding. Seriously dreamy!! They hit the ground running with all the plans to transform the property. Given their many amazing talents as a couple there were several DIY details that they made themselves. From building tables, a bar, corn hole games, and giant Jenga to hanging cafe and twinkle lights and weed whacking they literally put blood sweat and happy tears into their wedding. Alex and Taylor didn’t realize was how much they would love the planning process and how it would provide such an amazingly creative way for them to collaborate and create a day that expressed who they were as a couple. Among many the many gorgeous details I loved the single row of handmade tables for their family style reception and that Taylor wore her Grandmother’s heirloom vintage watch among her other bracelets on her wedding day. Incorporating something personal and meaningful into your wedding is always a good idea! Amanda and Jim’s wedding at Bloomgren Ranch here in Santa Clarita this fall was a beautiful day in many ways. The day started off with the girls getting ready at Valencia Blo Lounge where they all spent the morning getting prettied up, laughing and just having a good time hanging out together. I loved the curls in Amanda’s hair! The guys hung out at the house and enjoyed a chill morning getting ready and having a few cigars. After everyone was mostly ready to go we headed to the ranch for getting dressed just before the ceremony. The ceremony took place at the top of the hill overlooking the reception area. There were some beautiful tall trees and giving some nice shade for all the guests in the seating area. Jim’s jaw dropped when he saw Amanda coming down the isle. She was such a beautiful bride! They shared a few laughs as they exchanged vows and then stepped to the side where together they did their sand ceremony. They were both beaming at the end of the ceremony and their exit photos are some of my favorite from the day. The reception under the stars made for a beautiful evening for dinner, toasts, dancing and enjoying the company of all their friends and family.